This on-line project is part of the Center for Improved Engineering and Science Education (CIESE) program. As they complete this series of lessons, students will use real-time data to solve a problem, study the correlation between earthquakes and tectonic plates, and determine whether or not there is a relationship between volcanoes and plate boundaries. 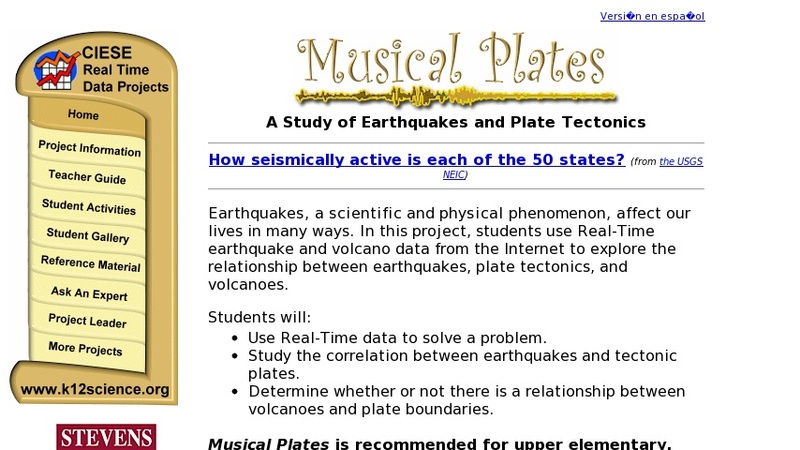 Musical Plates has four Core Activities that will teach students how to access and interpret real-time earthquake and volcano data and to how use the information to solve a real-world problem. Each of the core activities is designed to be used in a 45-minute class period. This unit also has three enrichment lessons and a final project lesson that can also be used for assessment.